Republic Parking System offers several types of the parking area for the affordable prices that are lower than in San Francisco or Oakland Airports. 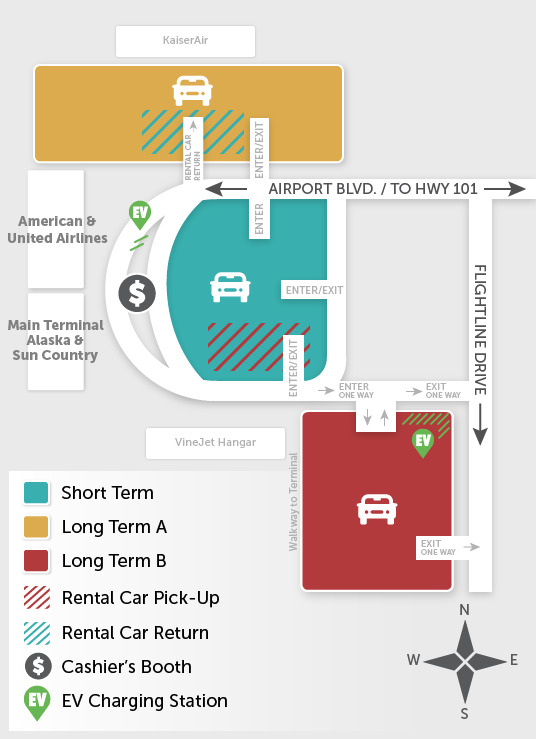 All of the parking lots are located in the remote access to the terminal. Short-Term Parking Lot offers parking lots where the first 2 hours of stay are free of charge, each additional half an hour fee is $1, and the maximum 24-hour stay fee is $15. The payment gate is located at the exit. Long-Term A Parking Lot offers parking lots where the first 2 hours of stay are free of charge; the maximum 24-hour stay fee is $11. The Long-Term A parking lot is used for multi-day trips. The payment gate is located at the exit. Long-Term B Parking Lot offers parking lots where the first 2 hours of stay are free of charge; the maximum 24-hour stay fee is $11. The weekly price is $56. The Long-Term B parking lot is used for multi-day trips as well. The payment gate is located at the exit. The Parking area is opened from 08:00 until 22:00. The pick-ups and drop-offs are operated being done in front of the Terminal building. Payment may be made in cash at the attended booth across the terminal building or with the credit card and money at the payment gates located at the exits of the parking lots. The invoice will be given based on the parking ticket with the departure time and owner's information.